You might think that a goldfish will be happy in a small fish bowl but that’s not the case. Goldfish actually need a lot more space to thrive. That’s why you should always use the best goldfish tank you can afford. Goldfish can grow up to 10-inches and live as long as 20 years in the right conditions. Making sure your goldfish live a long, happy, and healthy life all starts with the right tank. How to Choose a Goldfish Tank? How to Set Up a New Goldfish Tank? When it comes to fish tanks for your goldfish, there are a few really good options. There are kits that include everything you need, bow-front tanks for a unique and interesting view, as well as bare tanks that let you choose all the components separately. One of the best looking goldfish tanks available is this one from SeaClear. This 20-gallon tank appears to be seamless. How do they do it? With a special molecular bonding and heat polishing process that provides a crystal clear view. This tank is made out of acrylic which has a lot of benefits. It’s practically leaking and break proof and can handle a little roughness. Because it’s 17 times stronger than glass. it’s chip and crack resistant. This makes it a great choice for a home with other pets or children. Not only is it tough, it’s also about half the weight of a glass tank of the same size. This makes it easier to transport, lift, and setup. This combo kit includes a 20-gallon tank and fluorescent light fixture. Plus, it’s covered by an industry-leading lifetime warranty. This starter kit from Aqueon is a great choice because it has everything you need to get started building a happy, healthy home for your goldfish. It includes a 20-gallon tank, LED energy efficient lighting, a QuietFlow power filter, filter cartridge, thermometer, and fishnet. Plus, there are fish food samples and a water conditioner sample. The filter features a red LED light that indicates when it’s time to swap out the filter. Speaking of the filter, the included pad featured enhanced 5-stage filtration and an ammonia filter pad. This gives you a great start and helps you maintain a balanced and healthy environment. The top hood includes the LED lighting as well as a feeding door that allows you to easily drop food in the water without having to remove the hood. Also included is a complete guide to help you with the initial aquarium setup. For something a little larger, check out this 45-gallon bow-front tank from Fluval. 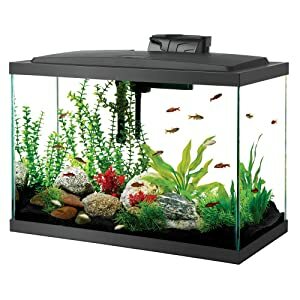 This is a great choice for beginners and people who have experience setting up and maintaining an aquarium. The bow-front shape provides a great view of your goldfish and tank decorations while allowing just a little more room for your fish to swim. It adds an interesting look to your tank by making it just a bit more interesting. Everything you need for initial setup is included. It comes with a powerful C4 filter which performs 5-step filtration the keeps the water healthy and balanced. Plus, all the water treatments and food you need of get started are included, too. Also included are a net, thermometer, and care guide to help get you started. Plus, the low-profile LED lights are perfect for planted aquariums because they generate 1470 lumens, which is ideal for plants and looks great, too. Next up is another bow-front option, this one from Aqueon. The curved front, black silicone seals, and black hood create a unique, sophisticated look that makes a nice frame for your tank. It looks a little more dramatic than a typical rectangular design. This tank comes with a full hood with integrated LED lights and a Day White lamp. There’s even a spot for an extra lamp if you wish to add one. That’s not all. The filter, filter media, fishnet, thermometer, food, and conditioner samples are also included. All you’ll need to do is get substrate, decorations, and, of course, your goldfish and you’ll be ready to set up your new tank. If this is your first tank, don’t worry. They also include a start-up guide so you can start your tank with the best foundation. If you don’t want to invest in a whole kit, this simple 20-gallon glass aquarium is a great choice. The sides and bottom are made using triple-strength glass that’s welded together using silicone to prevent leaks. The top of the frame is designed for a recessed cover. There are circumstances in which you might not want a full starter kit. 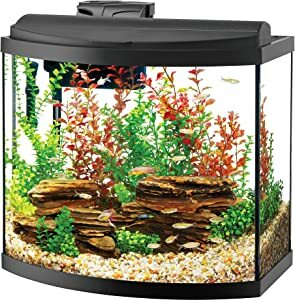 Maybe you already have a filter and some of the equipment from a previous aquarium or if you just want to take your time and get each piece separately. Whatever the case, this is the best bare tank around. There’s a lot more to choosing a goldfish tank than meets the eye. Here are some things to consider when choosing one. As we already mentioned, goldfish can live for a long time. To make sure they reach adulthood their full potential, the right tank is essential. Because goldfish grow very rapidly, it’s best to start with a larger tank so you don’t have to keep upgrading. Go for 20-gallons for one or two goldfish. There’s a few reasons for having a tank this size. Large tanks are easier to keep clear, especially if you only have one or two fish in them. That means less maintenance, fewer water changes, and a happy, calmer goldfish. Goldfish are very sensitive to temperature which is why water changes can be so stressful. Not only that but the larger the tank, the less sensitive the water is to ambient temperature changes. Here’s the thing, goldfish are meant to be pretty big. If their environment was unrestricted, they could potentially grow up to be upwards of 10 inches long. By keeping them in a small tank that inhibits their growth, their bodies don’t develop properly. Goldfish can also live a really long time. If their growth is inhibited, they usually only live a few years instead. Believe it or not, in the right conditions, goldfish can live up to 20 years. Goldfish grow very quickly and can get very heavy. Because of this, they use a lot of oxygen which is why a large tank with a lot of surface area is essential to their well-being. Another reason it’s a good idea to have a large tank is because goldfish are pretty messy. They’re big and make a lot of waste. Having more water volume dilutes the waster so the water quality is affected much more slowly than in a small tank. Another thing to think about is whether or not you want more than one goldfish. They’re a social species and love having company. That said, more fish means a larger tank. You should add 10 gallons of water to the size of the tank for each additional fish. As for shape, remember that more surface area is better. Rectangular tanks are the best shape for this. Plus, your goldfish will love swimming the length of the tank as opposed to swimming up and down. Avoid tanks that are too deep or oddly shaped. There are advantages and disadvantages to both glass and acrylic so the choice is up to you. Acrylic aquariums are really lightweight. They’re easier to lift which makes acrylic a good choice for large tanks because you should be able to lift them unassisted. They’re generally just easier to transport and move. Another great thing about acrylic is that it’s a little more forgiving than glass. If you have children in your home, this is particularly important. The can handle a small collision or impact without cracking or breaking. 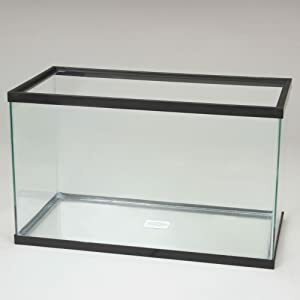 The bonding process used to create acrylic tanks is pretty impressive. They likely won’t leak and hold up very well over time. The seams are often done so well that they’re practically invisible which makes more a spectacular view of your tank. Temperature is another thing to consider. Acrylic retains heat better than glass which means that there will be fewer and less extreme temperature fluctuations. Glass aquariums don’t scratch but are more susceptible to cracks and breaking. They also keep their shape while an acrylic tank can bend or warp over time. While acrylic tanks look great at the beginning, they can yellow or get cloudy over time if exposed to too much sunlight. On the other hand, glass will never cloud or discolor no matter how much time it spends in the sun. Glass is heavy and somewhat impractical for large tanks over, say, 200 gallons. It’s just too much to lift and can really strain the stand or even your floor. Another thing to think about is that glass typically only comes in ordinary shapes. That said, rectangular tanks are the best suited for goldfish so this is still an appropriate choice. Setting up a new goldfish tank isn’t all that different from setting up any other fish tank, but there are a few things to keep in mind. Here’s a quick step-by-step breakdown of what to do. Remember, goldfish are messy so you need a powerful filter with a strong flow rate. Flow rates are measured in gallons per hour. The way to figure out a good flow rate is simple, just use a filter that cycles between five and 10 times the volume of the tank every hour. So, for a 20-gallon tank, use a filter with a flow rate between 100 and 200 gallons per hour. Undergravel filters are quite popular with other kinds of fish but are not ideal for goldfish tanks. Use a canister filter instead. Set up the filter on the side of the tank but don’t turn it on just yet. After you have your filter set up (but not turned on), it’s time to focus on gravel. Make sure you rinse all gravel carefully before putting it into the tank as it usually contains a lot of dirt and sediment. Once it’s rinsed, add about three or four inches of gravel to the bottom of the tank. Use larger gravel as goldfish tend to put small gravel in their mouths. Add any large decorative rocks, logs, plants, or anything else you want to put in the bottom of your tank. Fill the tank with cold water to about the halfway point. The water has to be dechlorinated. You can use tap water but make sure you get the right water treatment and use it properly before adding water to the tank. Adjust your decorations as needed since they’ll probably move around a bit as you’re adding the water. Fill the tank all the way to the top with clean, cold, treated water all the way to the top leaving only about an inch or so of space. Make sure the pump is working appropriately before you put any goldfish in the tank. Allow the water to cycle for several minutes so that it’s well circulated. If you haven’t already added water condition, do so now. You want to water to be around 70 to 74 degrees before adding your goldfish. Contrary to what a lot of people think, goldfish actually don’t thrive living in a small bowl. They actually need a much larger tank to grow to their full potential and live a long, healthy life. Our top pick for best goldfish tank is the SeaClear Acrylic Aquarium Combo. 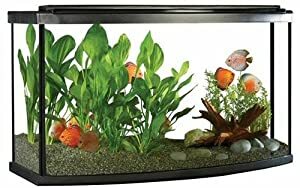 It’s a gorgeous tank that appears seamless and crystal clear giving you an ideal view of your pet. Plus, it’s really strong, leak free, and lightweight. We also like that it’s a small kit that includes the tank and a light fixture. This way, you can still take the time to research and choose the filter that you want to use. This was a very clear and informative article. Told me exactly what I needed and the choices I have . Excellent. Well done. Thank you. Wish all enquiries ended up like this. What about cycling the tank and testing for ammonia, etc. Prior to placing the fish in the tank? Is it necessary?